Diane handcrafted a Raggedy Ann doll. You remember the Raggedy Ann doll, don't you? 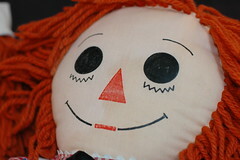 It was a rag doll that was most known for its red yarn hair. This particular Raggedy Ann doll was special. It was to be given to a needy child at Christmas. When Diane finished creating the doll, she gave it to her husband Bill with instructions to deliver it to an organization that could put it in the hands of a child who needed it most. Bill set out to find that organization. To his amazement, there was no organization he could find that could share this love-filled toy with a needy child. Bill had to return home to his wife, who put so many hours of her time and love into the doll, and tell her that he could not find any such organization. Diane could have felt heart broken. She could have given up her dream of having that Raggedy Ann doll change a child's life. Instead, she suggested that her husband should start an organization that could put toys in needy children's hands. He did! Bill Hendricks was a Marine Corps Reservist. His launch of this organization was so successful, that the Marine Corps adopted Toys for Tots. Marines have conducted successful nationwide campaigns at Christmas each year since 1948. Through the U.S. Marine Corps Reserve Toys for Tots Program, Marines have distributed more than 370 million toys to more than 173 million needy children! Toys for Tots would not exist today if it weren't for a wife who wanted to make a difference in a child's life and a husband who was willing to take action when he was presented with a need. They created the spark that set the world on fire. What need are you aware of that you should be taking action on? Be the spark. Note: This is one of my favorite nonprofit startup stories. If you have a nonprofit startup story you would like to share, please go to http://www.everydaygivingblog.com/2008/07/wanted-nonprofi.html.